Open-plan living can be as easy as removing the supporting wall between two reception rooms, or widening your windows and doorways. So if you’re tired of poky, dingy reception rooms and you’re craving a Scandinavian smorgasbord of space and light, no need to move house. You can enjoy it from the comfort of your own living room. Some careful thinking about light and space – and the strategic use of steel supports – may be all that’s needed. Obviously you have gravity and structural integrity to consider, which is why we install rolled steel joists, or RSJs as they’re commonly known, to support the ceilings and upper walls. any extension work where a supporting wall or external wall is affected. 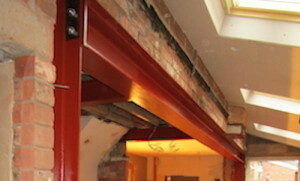 install the RSJ at the right time, in the right place, and with minimal disruption to the rest of your property. You may be a bit unclear on what an RSJ actually is – many people refer to them as a Roof-Supporting Joist or a Reinforced Steel Joist, but these are misnomers. More correctly RSJ is as an acronym for Rolled Steel Joist. The same shape of steel beam can also be called an I-beam or H-beam, or simply a Universal Beam. In practice, these beams are made in a strong H-shape, and are installed so that the long flat sides of the H are at the top and bottom of the beam, providing a very strong surface on which upper storeys, wall sections or ceilings and roofs can be constructed. If you’re still not sure what you need, contact Trafford Builders; we can advise you or show you examples of RSJs we have installed. 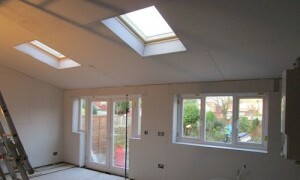 RSJ Installation – Rendering and much more. The Trusted Trafford Bricklayer.